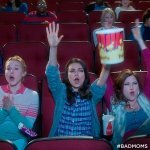 Bad Moms release date was Friday, July 29, 2016. This was a Nationwide in theaters release. Amy Mitchell (Mila Kunis) puts her family first, second, and third. But her man-child husband, high-maintenance kids and idiot boss are taking a toll. She gives and gives, and gives and gives, and then gives a little more, but it’s never enough. When the alpha moms (Christina Applegate, Annie Mumolo and Jada Pinkett Smith) at her kids’ school push her too far, Amy finally snaps. Good Amy becomes Bad Amy really fast -- and she doesn’t go alone. 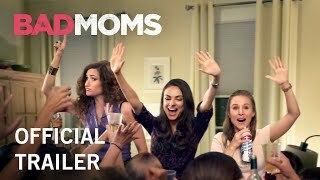 Teaming up with two other misfit moms (Kathryn Hahn, Kristen Bell), Amy gets a jolt of freedom that shakes up her life and might even make her a better mom. So call a sitter, put on your comfy pants, and pour yourself a double Chardonnay, because these moms are about to get bad. Leslie Mann and Judd Apatow exited in June. Taken off 2016 release schedule (7/28/15). Jon Lucas and Scott Moore, the writers behind The Hangover, will direct. added the tagline: "Party Like a Mother "